In Vajrayana Buddhism, a Yidam (Tibetan) or Ishtadevata (Sanskrit) is a fully enlightened being who is the focus of personal meditation, during a retreat or for life. The term is often translated into English as meditational deity. A Yidam is an enlightened being with whom one identifies during meditation: one perceives his or her own Buddha nature through such identification. 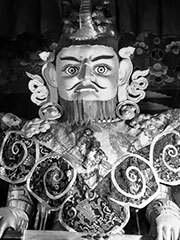 Some common Yidams include Hayagriva, Vajrakilaya, Samputa, Guhyasamaja, Yamantaka, Hevajra, Kurukulle, Cakrasamvara, Vajrayogini, and Kalacakra. Also, other enlightened beings such as the regular forms of the Buddhas, Bodhisattvas, Guru Rinpoche, certain Dharmapalas, Wealth Deities, and yab-yum representations, among others, can also be practiced as a Yidam. Yidams are not to be equated with deities, patron saints or guardian angels found in the Jewish, Christian and Muslim traditions. They are not regarded as protectors from danger or saviors. They are simply acknowledgments of the student’s basic nature. The student visualizes the outstanding characteristics of the yidam until he achieves complete union with it. The yidam, which can be masculine or feminine, may refer to the personal deity, the nature of which corresponds to the individual psychological temper of each adept. Chenrezig, Tara under her different forms, Manjusri and particularly Kalachakra, Hevajra and consort Nairatmya, Heruka and consort Vajravarahi, etc. are frequently chosen as Yidam, but any deity of the tantric pantheon may be adopted as such. The adept enters in union with his Yidam from the morning onwards, and ends the day with him. The yidam is used as a means of transformation. According to certain traditions, the yidam are considered as the emanation of the adept’s own mind. The term yi-dam is said to be a contraction of Tib. yid-kyi-dam-tshig, meaning «samaya of mind»- in other words, the state of being indestructibly bonded with the inherently pure and liberated nature of mind.